There are many things to do for Weekend in Miami Florida. Check out the events directory to find out whats going on in Miami. FRIDAY, APRIL 19TH, 2019, JOIN US FOR THE FULL MOON PARTY AT THE WHARF MIAMI Join us and celebrate an evening of fun, live entertainment, fire performances, & live fortune telling underneath the pink full moon! Join us on Friday, April 19th, 3:00pm - 4:00pm at IKEA Miami Kids’ Club, where children will use their imagination to create a bunny just in time for Easter. School is out, and we are ready to jump and have fun! Join us on Friday, April 19th at Mega Jump from 3:30PM to 5:30PM for 2 hours of fun at their 33,000 square foot mega trampoline park! Paul E's Pop Up Party! A DJ driven by his passion for cooking up beats & specialty dishes is putting together a pop-up to showcase both. Welcome spring with a cute wooden creature! Build your own wooden bunny along with a wooden egg. Join us on Friday, April 19th as we team up with J. Wakefield Brewing in Wynwood for our British Diner 'Pop-Up' Residency from 7pm til 11pm (or until we sell out). Area Stage Company Presents The Wizard of Oz! This beloved tale of a Kansas farm girl travels over the rainbow to discover the magical power of home has been entertaining audiences for generations. All ages event Everyone will need a ticket to enter Regular cameras and camera phones are acceptable, however no professional cameras or videos will be allowed. LIVE&LOCAL hosts the first Day Show of 2019 with performances from DaShawn Watson, Aster the GEMini, Sam Stan, and Cave! Then celebrate with us afterwards. Welcome to South Miami's greatest hotspot -- PUB52! Featuring live music on our stage every FRIDAY & SATURDAY at 8 pm, over 30 beers on tap, truly elevated American comfort food..
We're switching things up this Pillowtalk event and opening the stage to South Florida's best singers. We're excited to present the 2019 South Florida Freedivers Blue Water Invitational!! Gather Everybunny!Saturday, April 20thEgg Hunt starts at 10 a.m. sharp!and runs 'til 1 p.m.! EASTER EGG HUNT and SPRING CRAFT PARTY Saturday, April 20, 2019 Toddlers through 5th grade 10:00 a.m. to Noon Egg Hunt begins at 10:00a.m. SHARP! Come to join us for the first Homeowners and Residents of Snapper Village Egg Hunt. This event will consist of a 10,000 Easter Egg hunt , Free pictures with the Easter Bunny, Free food, drinks, games ,raffles,free books, bounce houses,pony rides,cotton candy, popcorn,ballon art, petting zoo, train rides,and much more. We will have a special menu and lots of surprises! This event is open to Kampong Fellows, members and their invited guests. Fellows and members are encouraged to bring friends who may be interested in a membership or fellowship. Two day block party event of entertainment and fun in the heart of wynwood!! Egg Safari entry is included with Zoo admission. Zoo members hunt early at 10 a.m.
Let’s get “egg-cited” for Easter! Join Creative Cove on April 20th at 11:30am and let your little bunnies paint and craft their very own giant Easter egg! It’s sure to be a hopping good time! The Link Up Invites You To Be.. Bad 'N' Boozy "Drink Well, Brunch Often"
Bring your little ones for an egg hunt at Ludlam! Join us as we Sweat+Connect at Society Fitness. 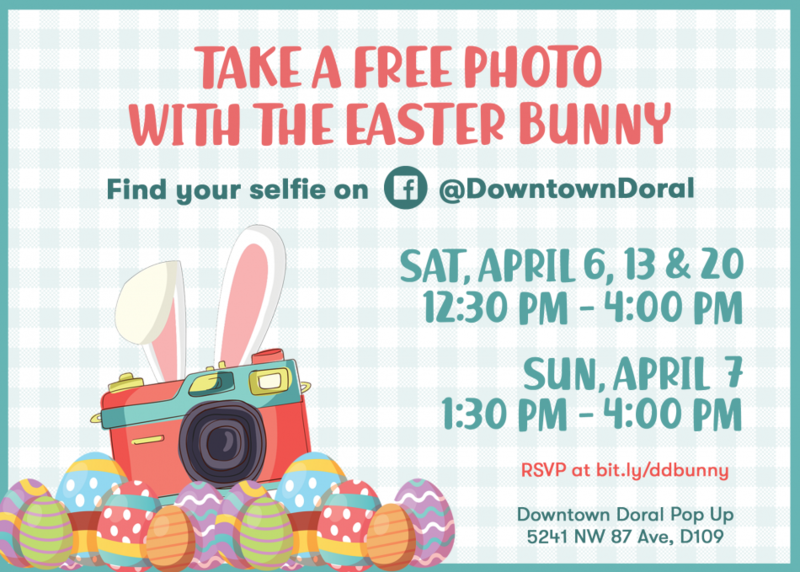 Mall of the Americas is pleased to invite families to our memorable Easter Celebration on Saturday, April 20th from 1 p.m. to 3 p.m.
DAB DAY PRODUCTIONS PRESENTS.. THE 420 CELEBRATION: EXPO & FESTIVAL! Inaugural food festival curated to celebrate the cuisine, culture, and economic development of the diaspora. Join us on Saturday, April 20th for our final Earth Day celebration at The Wynwood Yard, where will be celebrating Mother Earth, Spring and holiday traditions done with an earth-friendly twist. It's the freakin' weekend! Call the crew and meet up at the only place you'll need to be on a Saturday night. The grand opening for this exhibition will happen March 1st, 2019 at 7pm at Canvas Miami Gallery. On display till April 20th.Space is limited RSVP! Club Space is awesome because its open 24 hours on the weekends. Meaning there's never too little time in the day to make it out after work! Thy often invite ..
Dadeland Mall is a great choice for mall shopping when you want to hit a lot of places under one roof. Lots of choices! All logos and trademarks in this site are property of their respective owner. The comments and listings are property of their posters. All the rest Copyright © 2019 by 305area.com. All Rights Reserved.